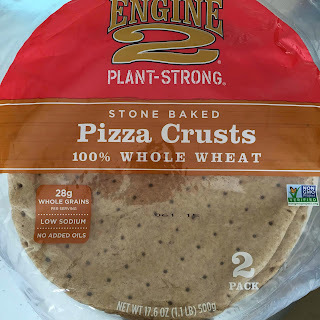 The Healthy Vegans: Engine 2 No-Oil Pizza Crust is DELICIOUS! Engine 2 No-Oil Pizza Crust is DELICIOUS! Engine 2 has come out with various products over the years & these Pizza Crusts are top notch! I wish they were organic, but at least there is no added oils! They bake up crisp and have a wonderful texture. For pizza sauce I use Tomato Puree in a glass bottle & heat it on the stove to reduce it with lots of various dried chili peppers & paprika plus some white pepper. Load on the veggies, this was all from my garden! Cherry Tomatos, basil, jalapeno & orange pepper. Best part about California is growing stuff year round!